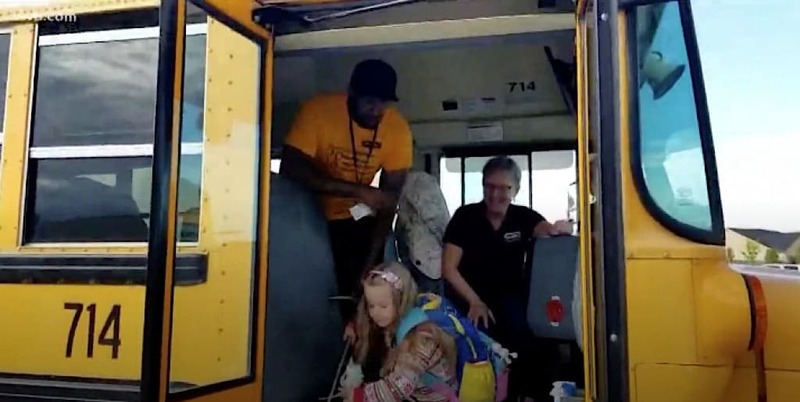 KTVB.com shares the touching story of a family whose special-needs children share a special bond with their school bus driver and aide. The three youngest Larson children attend Hillsdale Elementary near Boise in southwestern Idaho. Their school days begin with greetings from Cascade Transportation school bus driver Cindy Phillips and monitor Mikey Lee. Their mother Lindsay explained that all three children have special needs, including autism, speech delays and developmental delays, but they love riding their school bus, because of the kindness displayed by Phillips and Lee. That bond Lee has developed also allows him to connect with Christian on hard days. “There have been times when Christian is refusing to get on [the bus] and Mikey will come off and help cheer him up and get him there,” Lindsay explained. Both transportation employees have been on the job for some time and looked forward with anticipation, as one Larsen child after another begin to ride with them over the years. The pair demonstrates how important the role of trained student transporters is to parents of special needs students. “We have a lot of rough mornings around here, and I know that if I can make it that 15 minutes until the bus comes, they are going to help,” said Lindsay. For their part, Phillips and Lee were surprised to be specially recognized and stated that they were in the profession for the kids.